Eight months after Hurricane Maria made landfall in Puerto Rico, Harvard University unveiled the results of a study this week that puts the estimated death toll at more than 4,600 people -- over 70 times the official government count of 64. But the staggering statistic was overshadowed by other news of the week. Roseanne Barr's tweet about Valerie Jarrett and the subsequent cancellation of Barr's hit show "Roseanne" sucked up most of the airtime on Tuesday. Fox News, CNN, and MSNBC all covered the Harvard study on Tuesday, according to data compiled by the watchdog group Media Matters, but "Roseanne" was mentioned far more frequently per hour on television broadcasts than "Puerto Rico," data from the Washington Post says. "A lot of people were messaging me and saying, 'You know, does it tick you off that 'Roseanne' is a bigger story than Puerto Rico?'" CBS News correspondent David Begnaud said. "And I think one of my responses was, if people don't get it, I don't know that there's much more I can do to help them get it." Begnaud's reporting aired in the A block, or the first segment, of CBS This Morning on Wednesday. 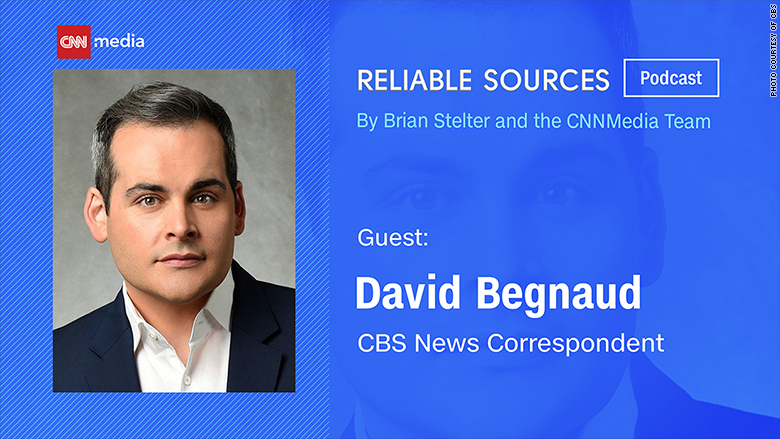 Begnaud, who is this week's guest on the Reliable Sources podcast, has been covering the hurricane and its aftermath since it touched down in September 2017. He told CNN's Brian Stelter that he's asked the Puerto Rican government about the death count time and time again, but that "the secretary of public safety would get offended every time I would press him on the possibility that it might be higher." Even more shocking, Begnaud revealed to Stelter, is that the death count could exceed the study's estimate, according to information he was given by a Harvard researcher. "My bosses always say, 'Give it to me in one sentence,'" Begnaud said. "Well, this is real simple. The death toll could be as high as 4,600. Period. And if that doesn't generate enough A-block attention on the broadcast on every network, cable and broadcast, then I don't know what folks are thinking." Speaking to Stelter from a van in the sweltering San Juan heat, Begnaud explained what the media as a whole has missed about Puerto Rico's story and why it's so important to stay on the Maria beat. Researchers at Harvard, Begnaud explained, conducted their study with "no help from the government of Puerto Rico" and by knocking on doors in metropolitan areas and in the mountains, where they asked people from roughly 3,300 homes if anyone had died. Researchers also listened to stories of how long people had been without power, water, or the ability to make a telephone call. Begnaud, too, has routinely traveled the area, speaking to hurricane victims and gathering the stories of those who have died in the wake of Maria. On Thursday, the day he spoke to Stelter for the podcast, he visited a woman who moves her bedridden husband onto the front porch every day because the couple's house hasn't had electricity for eight months. "As he sat there on the porch, sleeping in his own sweat, she grabbed my hand with both of hers and she said, 'Thank you for coming to tell my story,'" Begnaud said. "There is a sense here that I've gotten that the people of Puerto Rico don't really ever feel like their story has been told." This was evident just 48 hours after landfall. Begnaud remembers walking around his hotel in San Juan two days after the storm and being greeted by a colleague from another network, who said 10 or so people on his team were leaving the city. Trees had fallen and power lines were out, there was no gas at the gas station, and "we couldn't get but a tenth of a mile away from the hotel," Begnaud explained. But Begnaud and his team stuck around. And "it wasn't until day three, maybe four, that we got an eye-popping assessment of how bad it was," he told Stelter. "It did become the big story, but it sure didn't last as long as it did when Hurricane Katrina happened, or Hurricane Harvey happened, or other natural disasters that I've covered all over the country." Begnaud said he's often wondered why "people turned away so quickly" from news about Maria. "I think part of it is because, think about it, when do you ever see Puerto Rico on the news to begin with?" he asked. "I remember when they filed for bankruptcy, it was a reader on the evening broadcast. It was 15 seconds." Puerto Rico filed for municipal bankruptcy last May, days after the commonwealth defaulted on a $422 million debt payment. Begnaud said he was on vacation when he was called to the island to cover the Harvard study. "I sure as hell think it should be in the news more than it is," he said. He explained that Harvard researchers wouldn't share their data with his team due to privacy matters, so he sent out posts on Facebook soliciting stories of family members who died in the wake of Maria. Begnaud said the Puerto Ricans he speaks with "constantly remind me how they feel like second-class citizens." "They almost feel special that we are here telling their story. And I think in a way, that is what's emboldened my desire, even if I'm not on this island every day, to do some kind of update, to let those people know that we have not forgotten about them. We won't. We shouldn't."